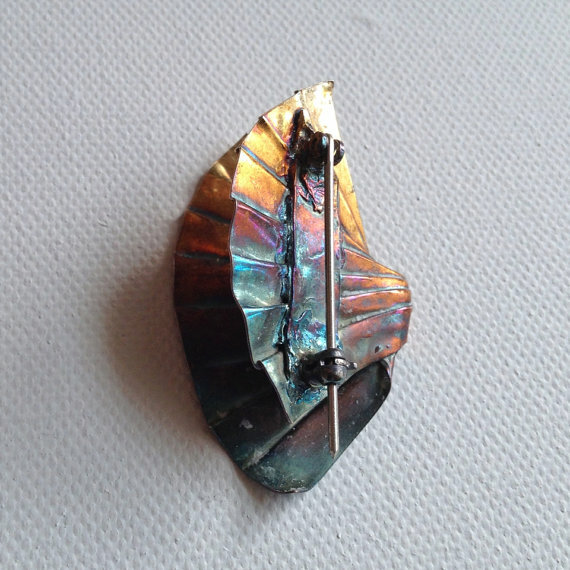 This new line of jewelry came about as a way to reach customers looking for a more unique and personal item; and also to challenge myself to create in new directions. 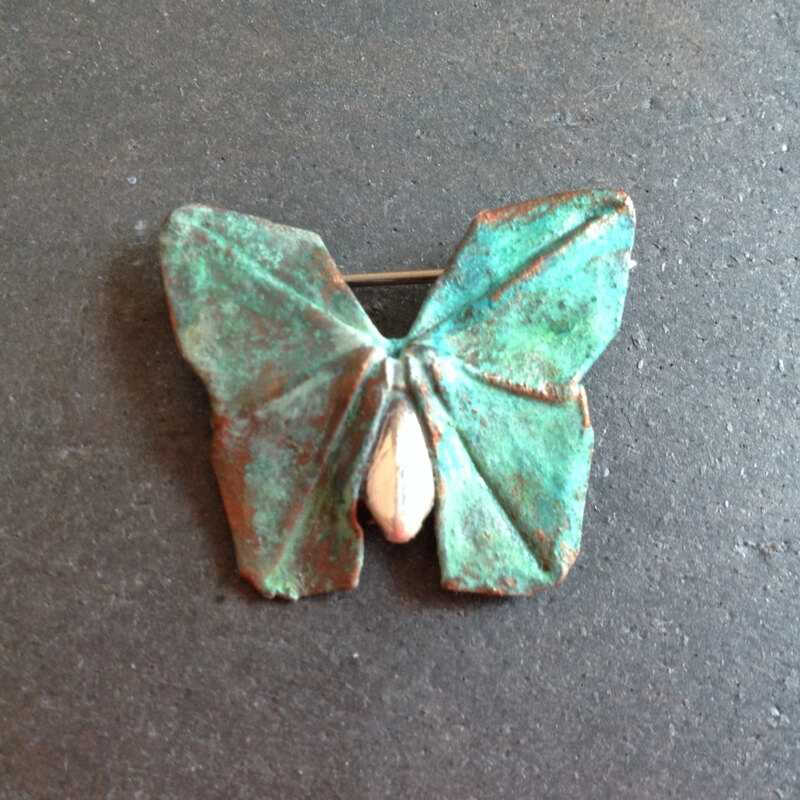 During 2013, I set out to make 12 butterfly brooches, each one very different, with its own name and style. 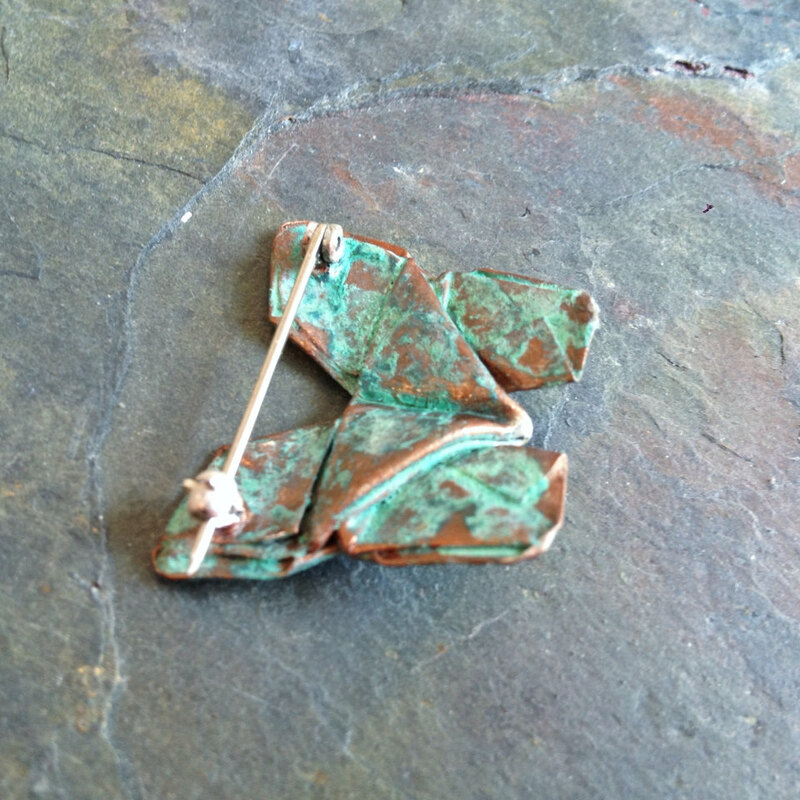 Each will be made only once, so every buyer knows they own a one of a kind piece of art jewelry. 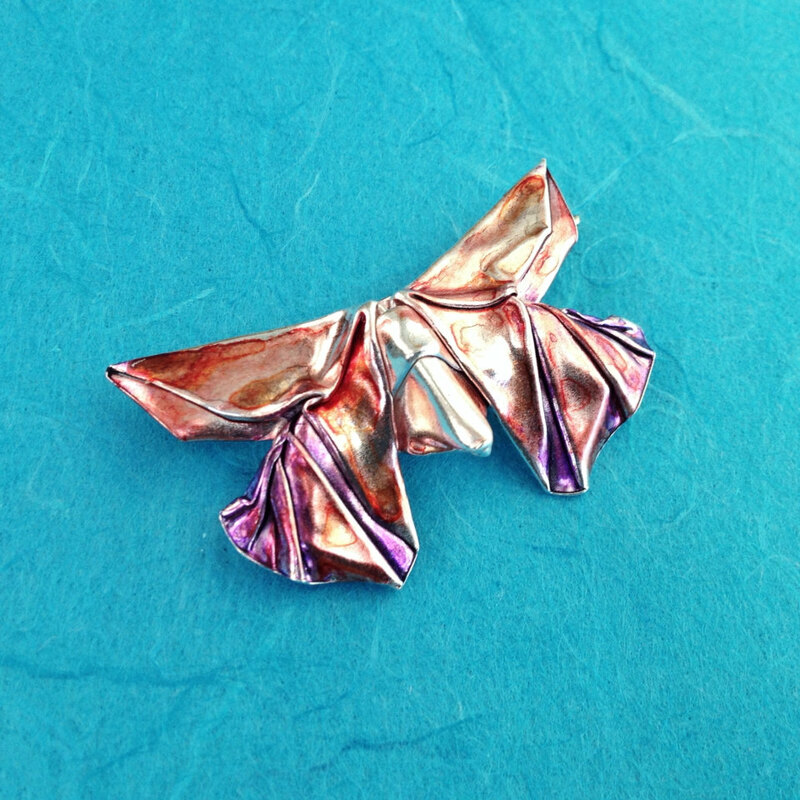 Some may use unusual folding techniques, some may incorporate gems, some may have colored accents or finishes. They come with exclusive packaging, and a certificate of authenticity signed by the artist. November brings falling leaves and long nights, and this butterfly takes in all the color and feel of the season. 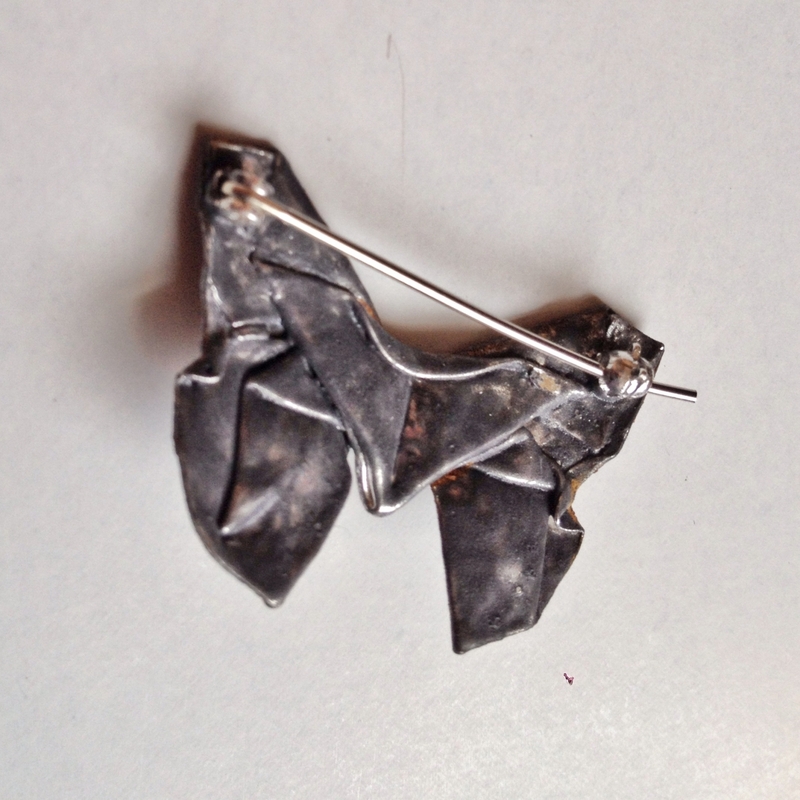 Its folded from a single square sheet of fine silver, then fired and polished. 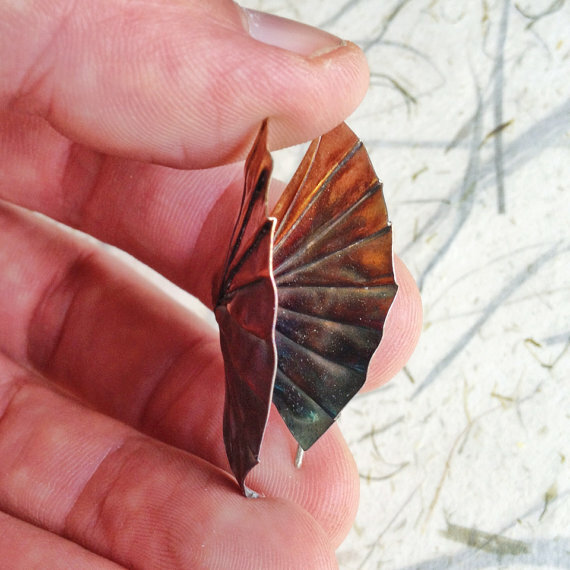 The wings were coated with a layer of raw iron, which was put through an antique process to bring out the deep orange and red colors of rust. The body was left highly polished silver. 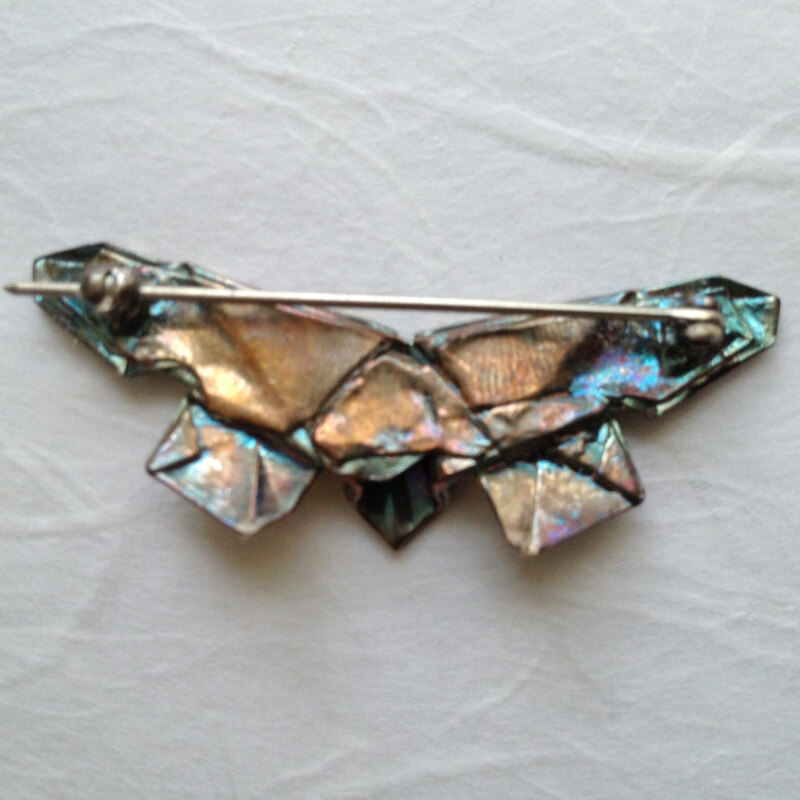 The pin back is solidly fuzed to the wing tips, so the brooch hangs normally without falling forward. October brings fall, with trees changing colors and the weather turning cooler. 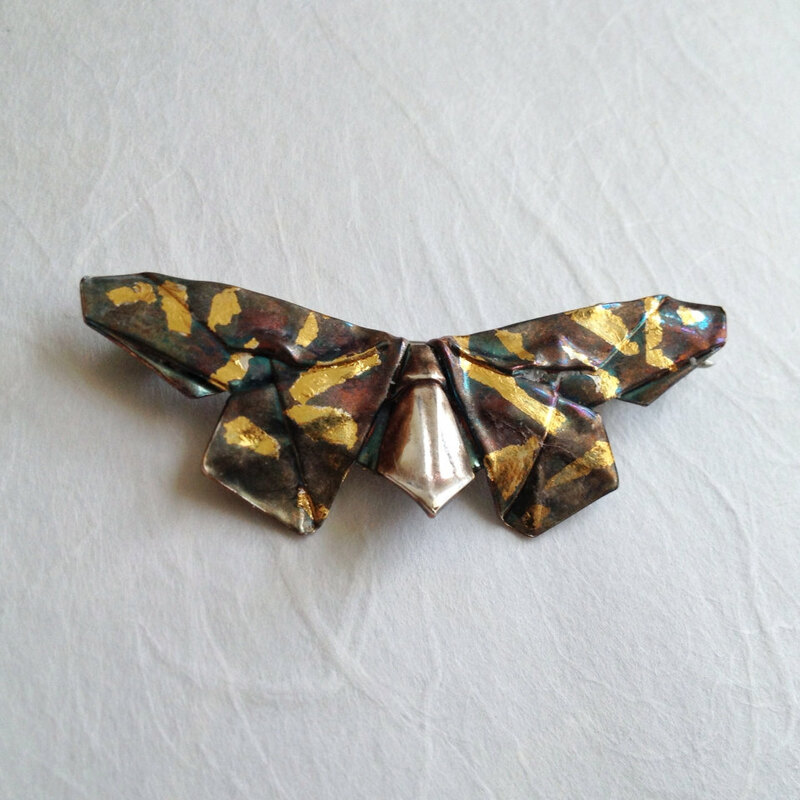 This butterfly captures the esseence of the changing season with dark colors and stark straight lines. 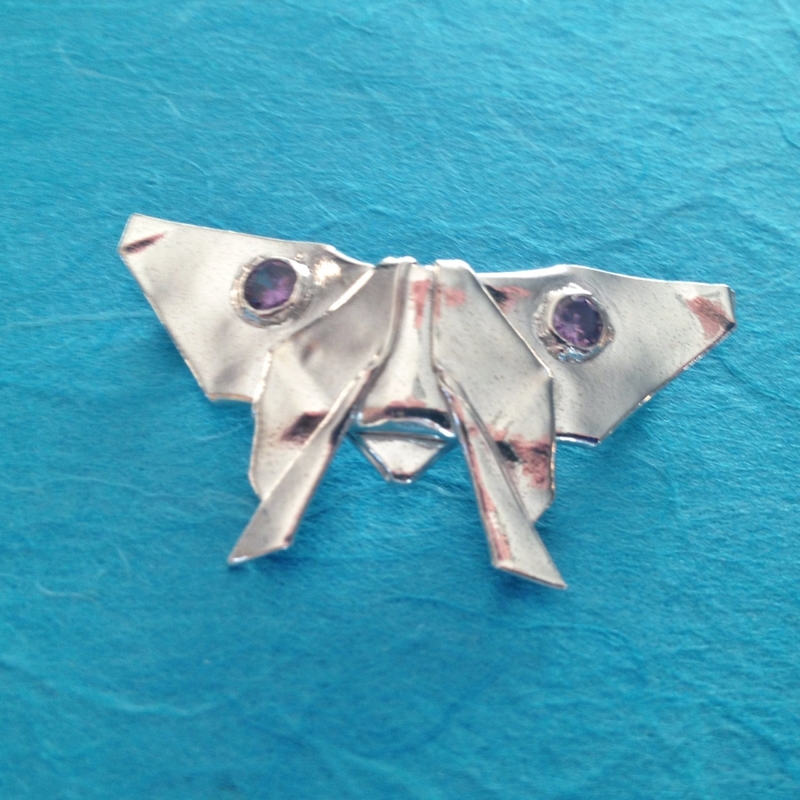 A single square sheet of fine silver was folded over 30 times. I then put it through a dark antiquing process to turn the metal nearly black, before polishing it for several hours to bring the tone back to deep grey. Its a shiny finish almost like pewter. For August, I tried to capture a rainbow of bright colors. 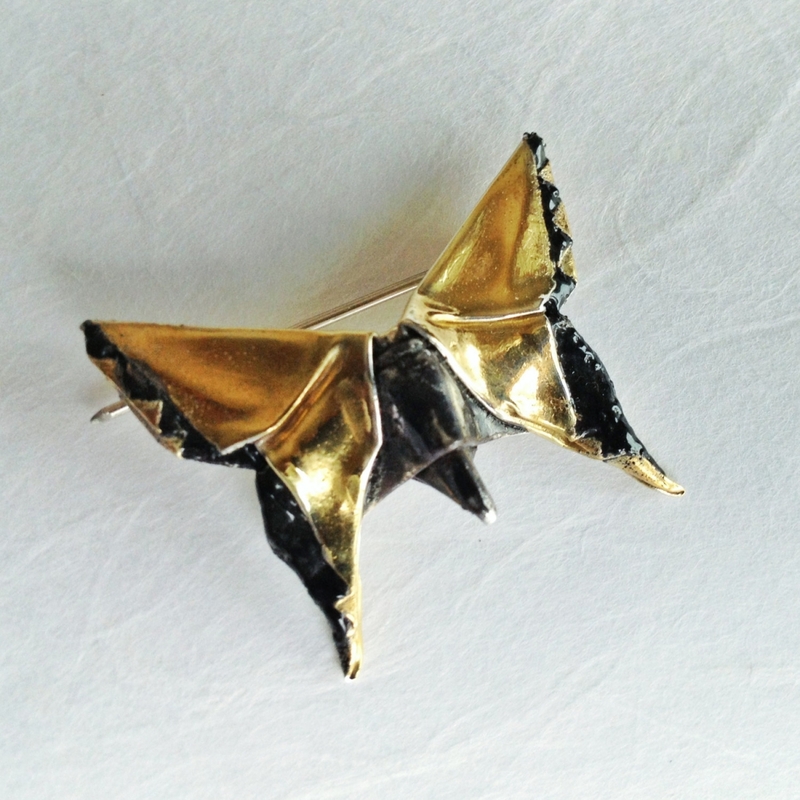 I started with a more intricate folding pattern, that created some interesting layered folds in the lower wings. These were perfect for layering various metal dyes, starting with deep purple, then working through red and into orange/yellow on the upper wings. The colors are sealed in with a clear acrylic coating. July is hot and exciting. To capture that feeling, I worked to learn an old technique called keum-boo, where gold foil is embedded into silver using high heat. 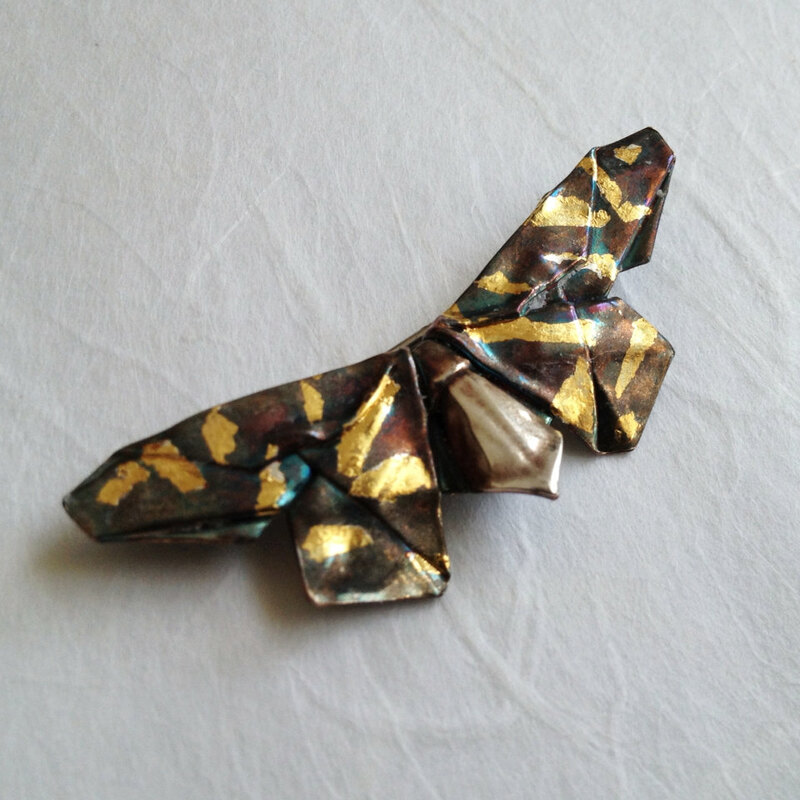 A single square sheet of fine silver was folded into a wide and narrow butterfly, then strips of gold foil embedded into the wings usings this fuzing process. 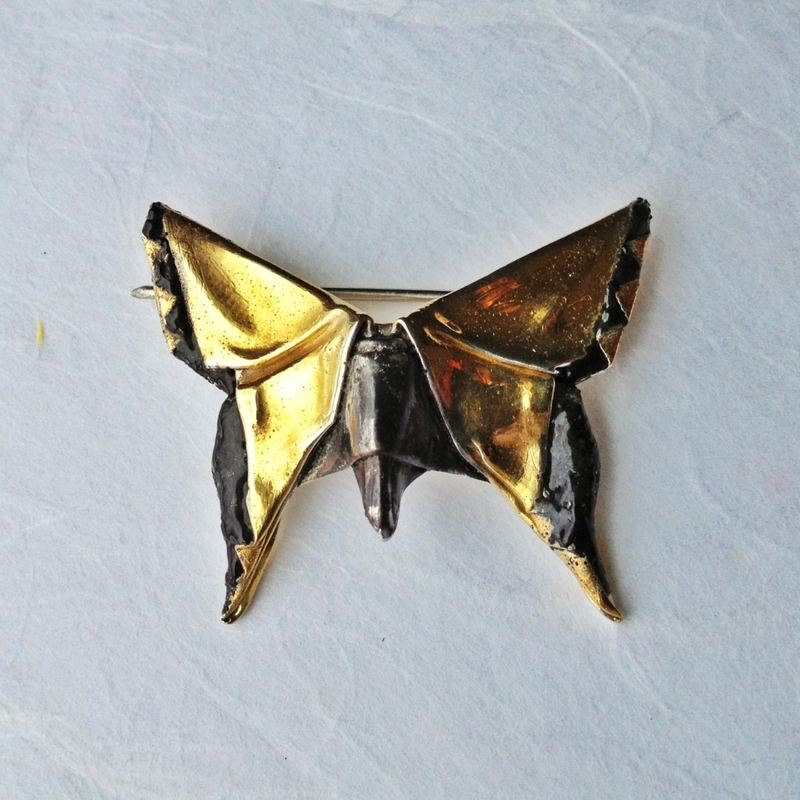 The wings were then treated with a sulfur antiquing process to turn the silver blue/grey but leave the gold untouched. It is then given a light coat of wax to seal in the color. June brings the start of summer, with hot weather and storms and rainbows. This brooch titled "Minuette" captures the heat and color of the start of the season. I experimented with new folds and classic coloration techniques. 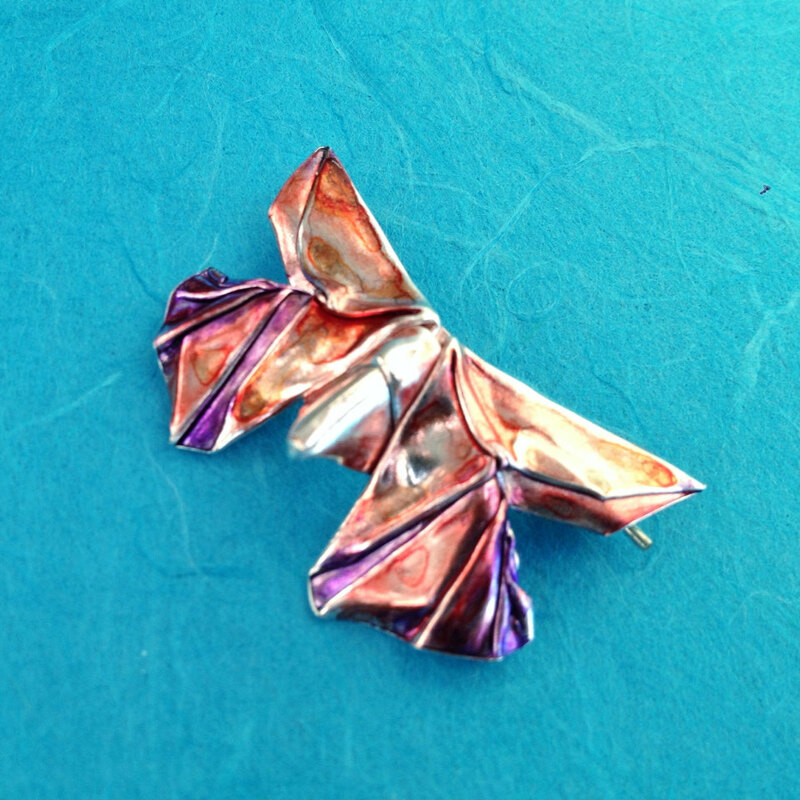 A single square sheet of fine silver is put through a series of overlapping accordion folds, then bent back on itself to make two distinct wings, front and back. The front wing sticks outward up to a quarter inch on the right edge, giving a great 3D effect. 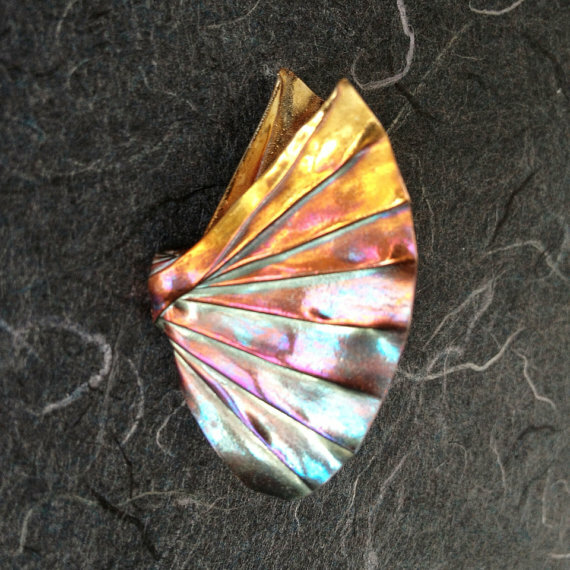 The iridescent effect is made by treating the silver with sulfur and heat, which brings out a rainbow of color from yellow to maroon to blue and purple. It is then given a light coat of wax to seal in the color. The pin back is solidly fuzed to the back, vertically down the back wing. 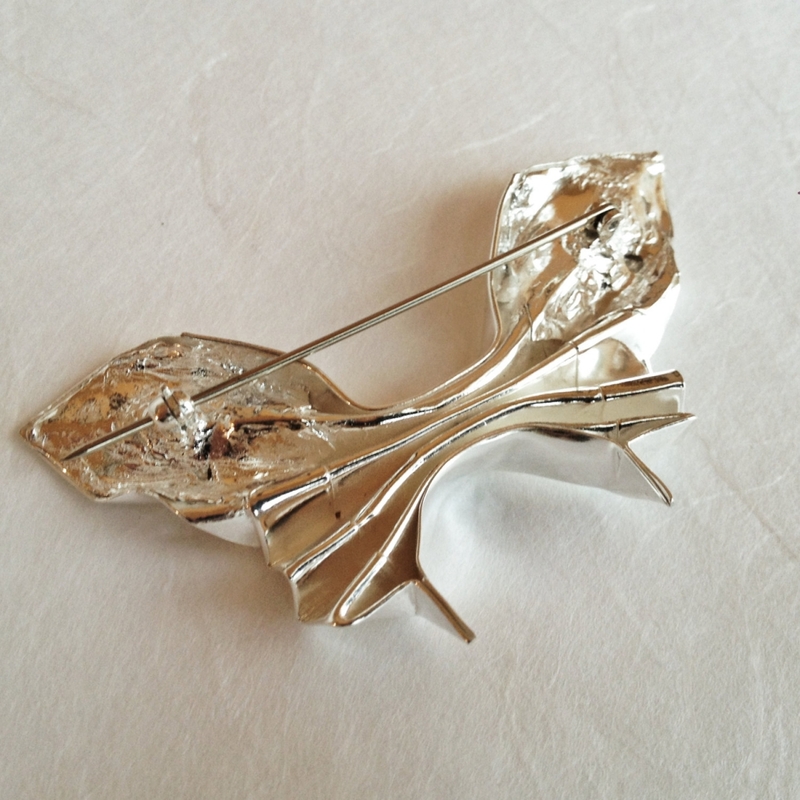 This is the brooch for May, named "Vivace", which ties in the deep greens of early summer. 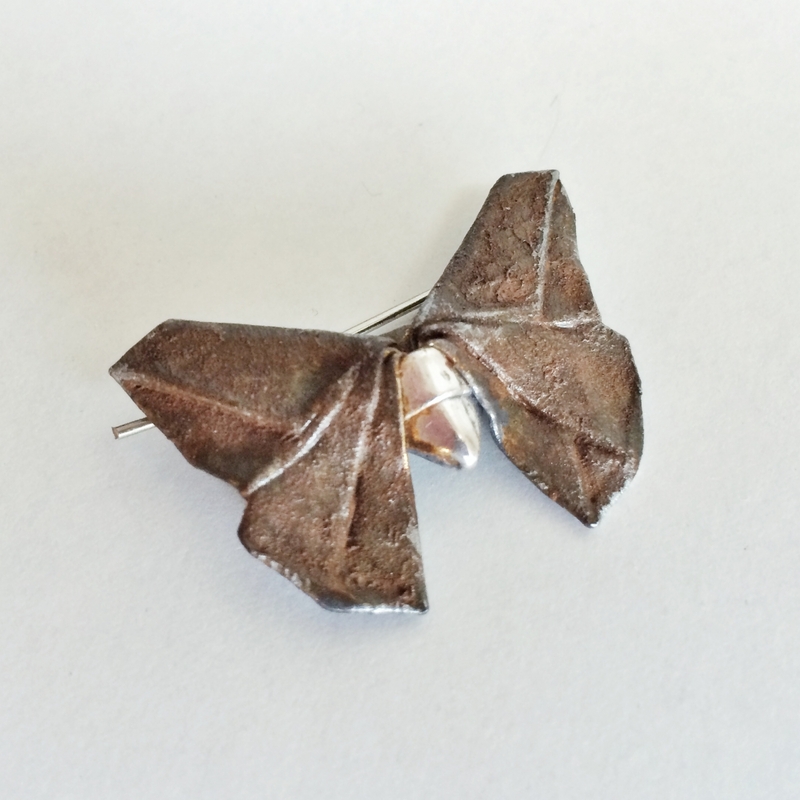 It started with a single square sheet of fine silver, which was folded into a compact origami butterfly using approximately 25 folds through the metal. 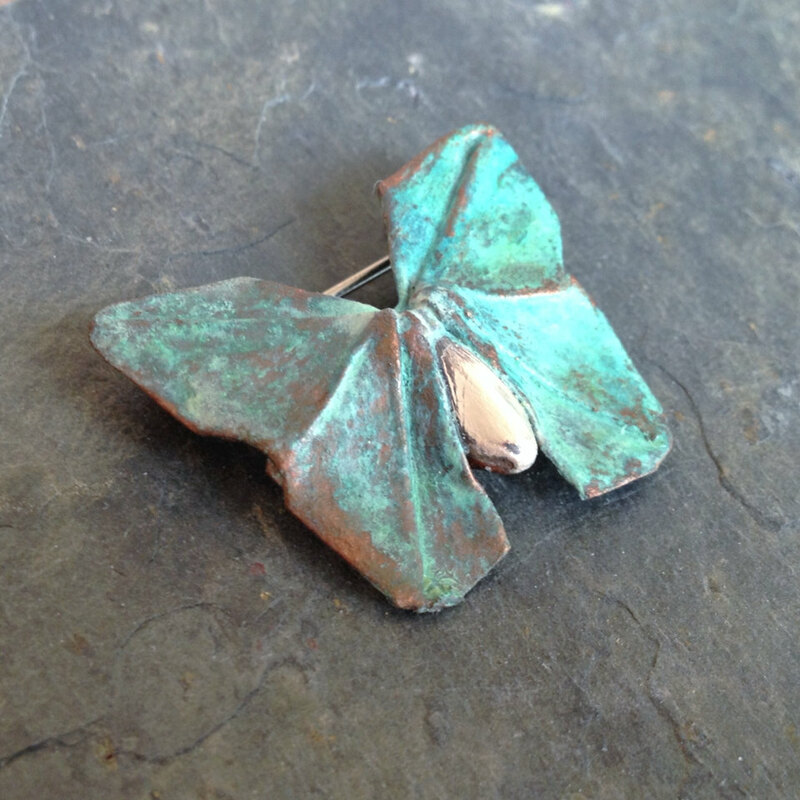 This was then plated in copper, and given an antique treatment to bring out the deep rich greens of copper oxides. 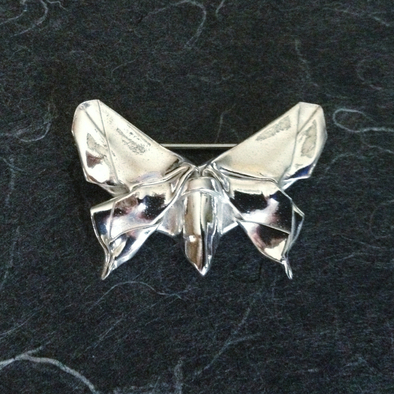 The butterfly's body was left unplated so the silver shines through. Finally it was given a clear protective coating to lock in the coloration. 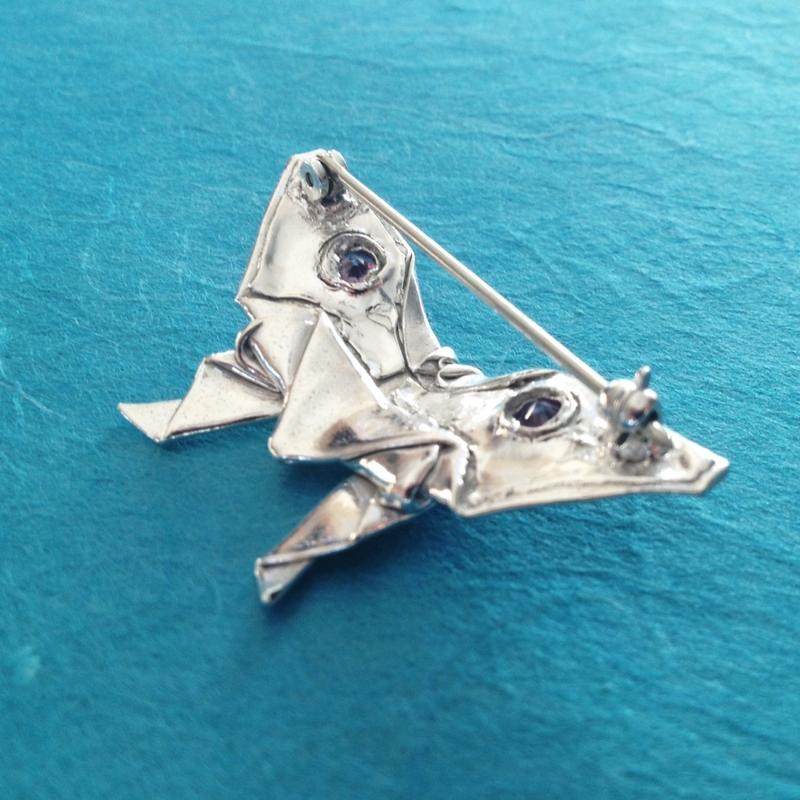 The pin back is solidly fuzed near the tops of the wing tips, so the brooch hangs properly without leaning forward. This is a smaller, more compact form, measuring about 1.25 inches across the wingtips, and just over 1 inch high. April's butterfly is a mixture of simple and complex. The folding pattern looks easy, but is a tricky accordion fold across two sheets of silver that are joined together and melded into butterfly wings. I went with a highly polished finish on this one, so as not to detract from the texture of the folds. 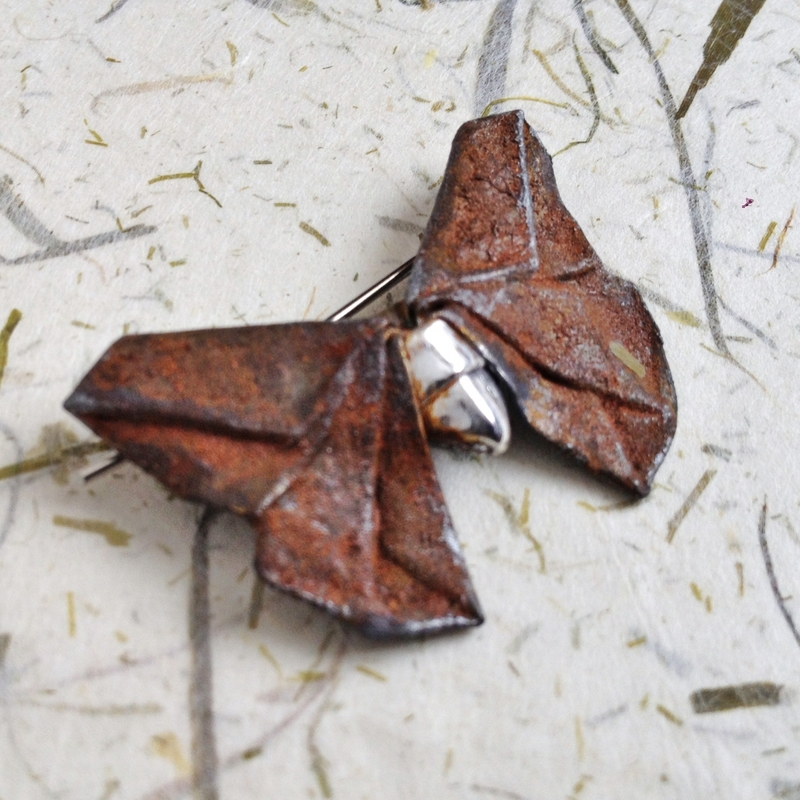 This is the largest butterfly so far, nearly 3 inches across, and uses twice as much silver as the first three pendants, but the results are stunning. March comes in like a lion, and this bold statement piece reflects that sentiment of the month. 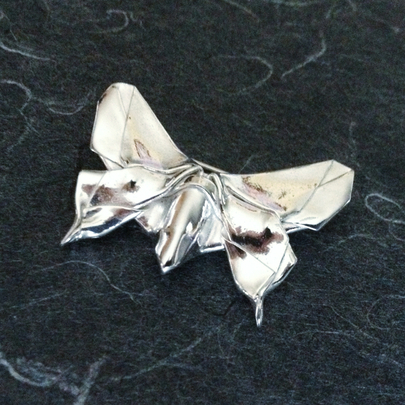 This butterfly begins with one of the most complex folding patterns, over 40 folds applied to a square sheet of silver. 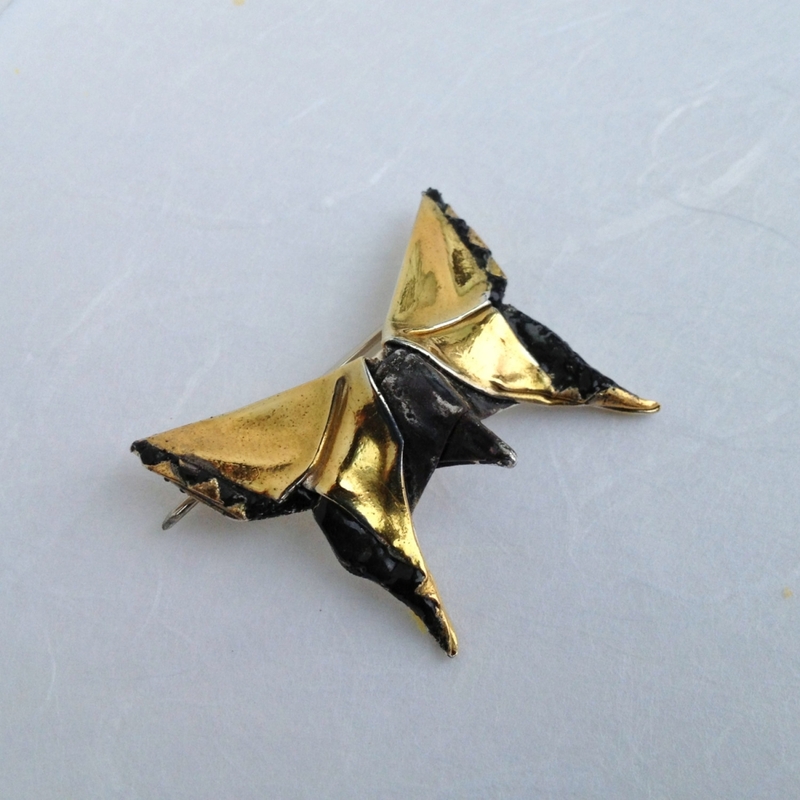 The wings were then highly polished, and a combination of black enamel and 24k gold plating applied. The body is highly oxidized silver, making it dark but still shiny. The effect is very different than what I normally make, bright and colorful with lots of contrast. If you look closely at the edges of the wings, the triangular pattern is formed by folds in the silver pattern, and amplified by the coloration. It is quite unusual and unique. The pin back is securly embedded in the silver, at the tops of the wingtips, to allow the brooch to hang normally without falling forward. Like every butterfly in the Concerto series, this comes with exclusive packaging and a certificate of authenticity signed by the artist. It is a one of a kind item and will never be made again. For February, I've added color in the form of amethyst gems, the birthstone for the month. 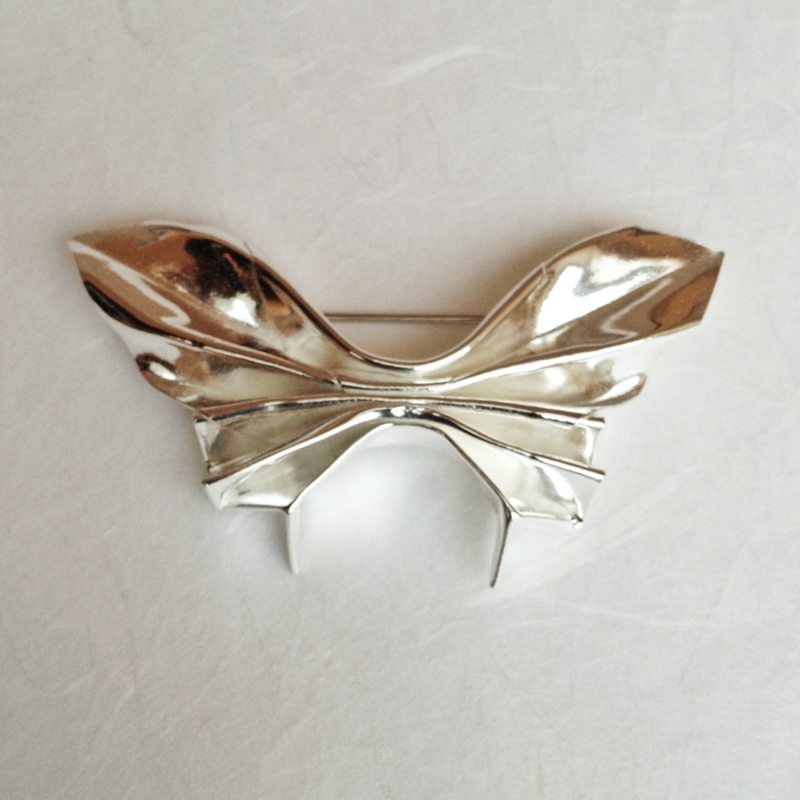 The form is modern and simple, using 16 folds to transform a square sheet of silver into a butterfly. Two 4mm amethyst colored cubic zirconia crystals are then embedded in the main wings, using a unique bezel technique that leaves the back of the gem open so light can pass through. 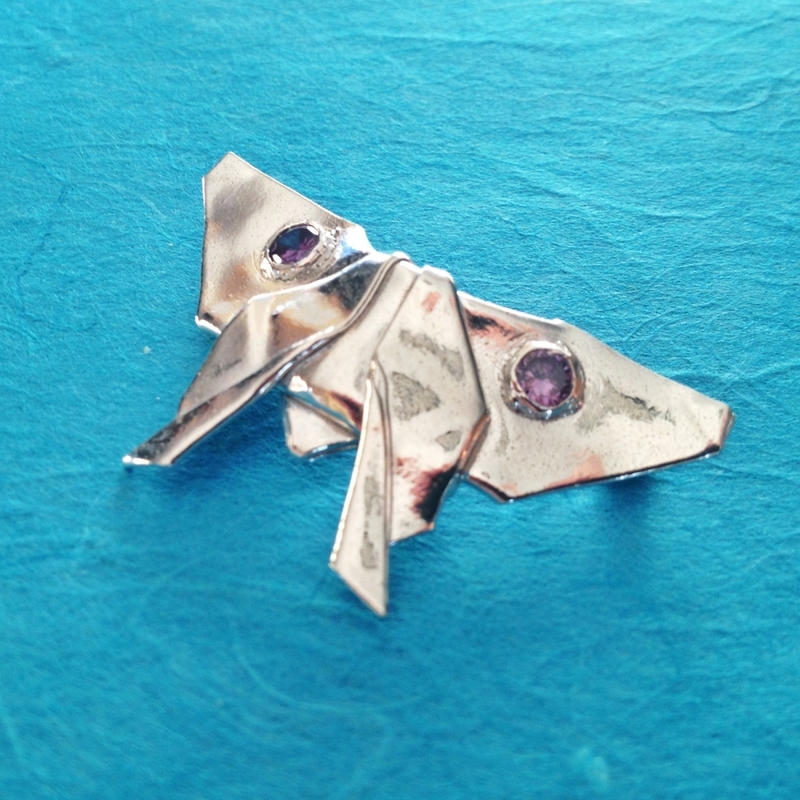 The pin back is solidly fuzed near the tops of the wing tips, so the brooch hangs properly without leaning forward. Like every butterfly in the Concerto series, this comes with exclusive packaging, and a certificate of authenticity signed by the artist. It is a unique design that will never be made again. 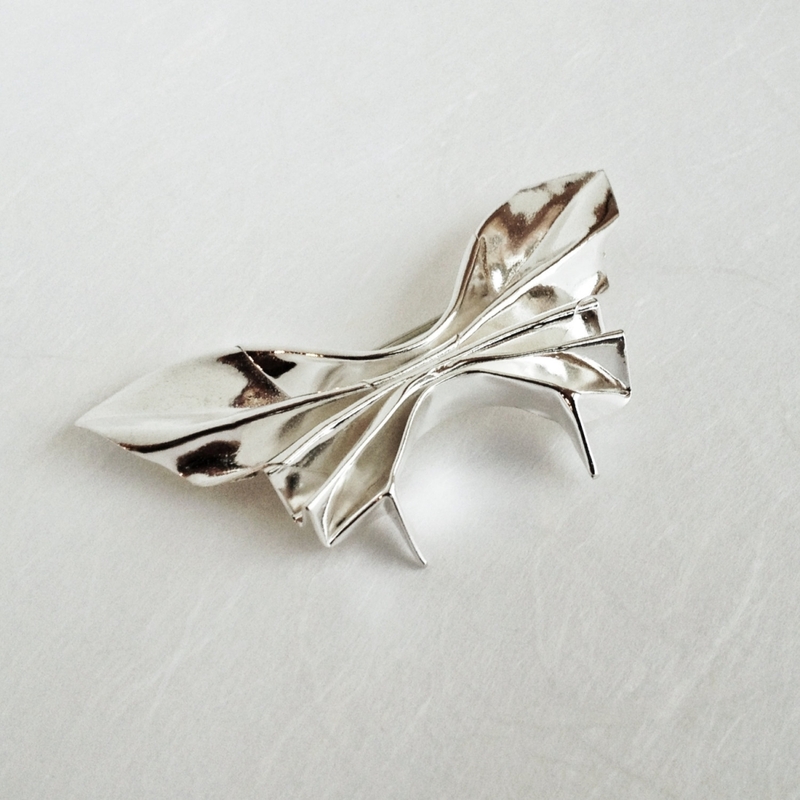 Like the cold, dark Winter, this butterfly is stark and simple, yet stunning. 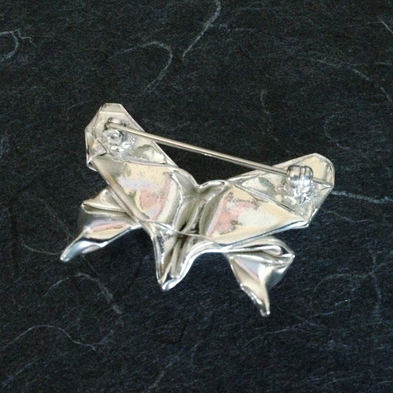 Over 30 folds are needed to transform a simple square sheet of silver into a brilliant butterfly. It is formed from approximately 5 grams of .999 fine silver, kiln fired, and highly polished; then coated with a thin layer of wax for protection. It is just over two inches across, and 1.5 inches high. The pin back is solidly fuzed into the silver, and runs from the top wingtips. This is intentional, so the weight of the pin does not cause it to fall forward when worn.